The Navy and Coast Guard have launched a search-and-rescue mission after a junior sailor on board the USS Carter Hall was reported missing, according to reports Sunday. The sailor is presumed to have fallen overboard Saturday, the Navy Times reported. The dock landing ship was on a training mission off the coast of North Carolina. The ship immediately began its search after a female third-class petty officer was discovered missing around 4:20 p.m. Saturday, the Navy Times reported, citing an internal Navy report. A pair of boots with a note was reported found on deck near the rear of the ship, the report said, according to the Navy Times. Several Navy and Coast Guard units are assisting in the search and rescue effort, a Navy spokesman said Sunday. “Were doing everything we can to find and rescue the sailor and our thoughts and prayers are with our shipmates and their families,” Navy Lt. Michael Hatfield told The Virginian-Pilot. The Carter Hall is conducting routine training operations in support of the Dwight D. Eisenhower Carrier Strike Group Composite Training Unit Exercise of the coast of Cape Hatteras, WTKR-TV in Hampton Bays, Virginia, reported Sunday. The name of the sailor won’t be released until 24 hours after next-of-kin has been notified, the station reported. 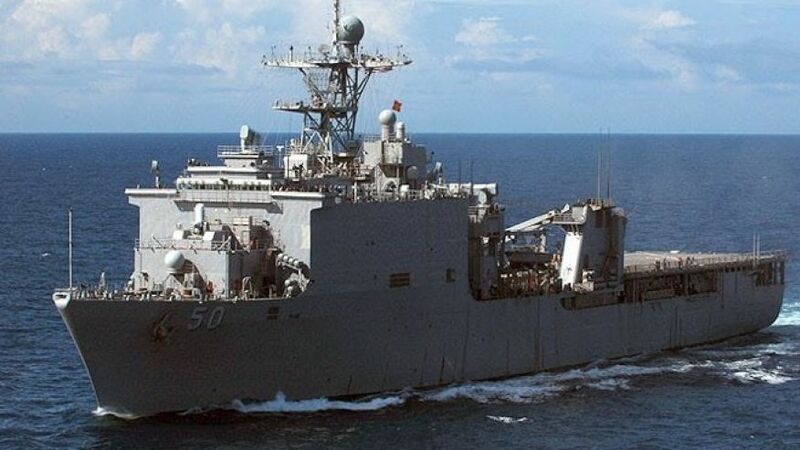 The USS Carter Hall is home ported at Joint Expeditionary Base Little Creek—Fort Story in Virginia Beach, according to the station.